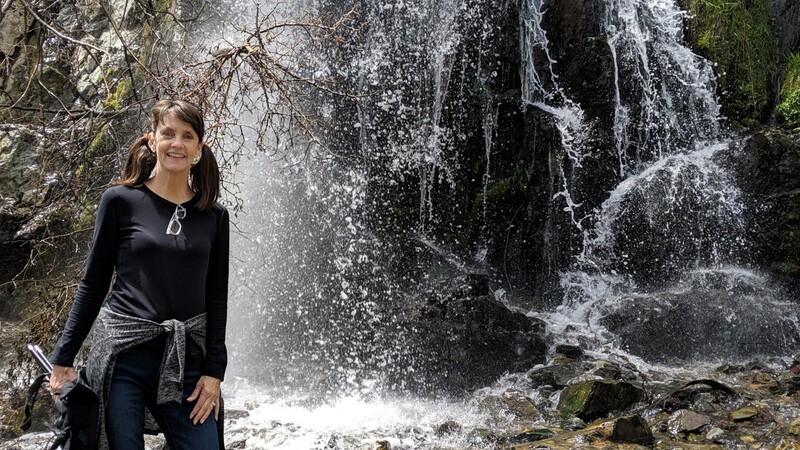 "The Tahoe Truckee Earth Day Festival returns to the Village at Squaw Valley for one of the largest Earth Day celebrations in the area. This free community event gives kids and adults the opportunity to learn about recycling, composting, alternative energy, and sustainability through hands-on activities the whole family can enjoy. At a diverse array of earth-friendly educational booths displayed throughout the day, participants can get dirty in the compost zone, explore new ways to recycle, learn about solar energy, and check out children's activities and brain teasers hosted by The Discovery." Besides exceptional opportunities to learn, we ran into exceptional people as well. This is an anniversary of sorts. When we moved to Tahoe in 2012, we volunteered at an Earth Day event. There we met Sierra State Parks Foundation's Heidi. She opened so many doors and provided us with so many incredible opportunities over the past seven years. What fun to see her today. Today's event encouraged us to open our minds. We learned how to make seed bombs, also known as "earth balls" or nendo dango. 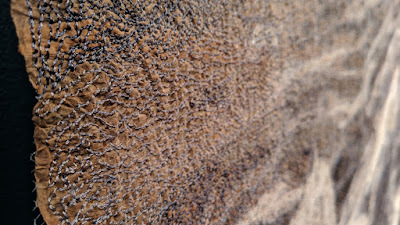 They consist of a variety of different seeds rolled within a ball of clay, preferably volcanic pyroclastic red clay. 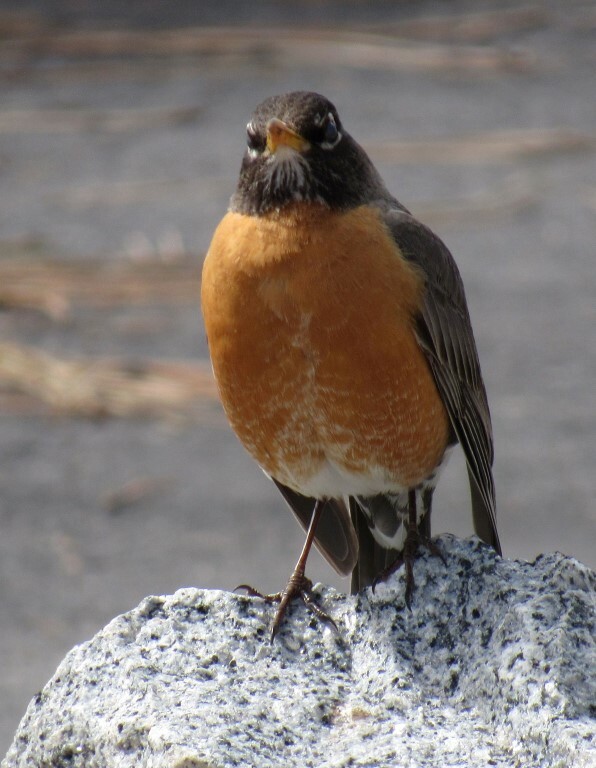 Seed bombing is a technique of introducing vegetation to land by throwing or dropping these seed orbs. So fun. ...to healthy bear poop. Yes, a diverse day indeed. There was even live music to give us all something to dance to. Do you ever wake up and just have to see a waterfall? 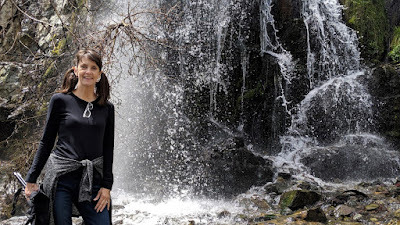 I did today and knowing that visiting our local Tahoe ones involved traversing too much snow, we were beyond excited to find Kings Canyon Waterfall, just down the hill in Carson City, Nevada. These 30-foot falls, just west of downtown, require a hike to access, but that hike is a relatively short 0.75-mile round-trip walk with about 175 feet in elevation gain on a clear trail. It's a popular jaunt for locals and a great reason to stop in Carson on your drive through (or when doing a Costco run). Interestingly, we learned this is Carson's water source and I think we picked the perfect day to explore this surprisingly hidden canyon. We had no idea this was here. Wow. The sound of the falls are almost deafening. Steve made a video of them, so worth watching. Besides a refreshing waterfall, there is a great deal of history on this road. During the 1850s, part of the Kings Canyon Road was called the Lake Bigler (Lake Tahoe) Toll Road, the Lake Tahoe Wagon Road in 1863, and in the 1920s Kings Canyon was also called Ostermann’s Grade, eventually becoming the Lincoln Highway. The early pioneers needed a way to get from Carson City to Lake Tahoe. Kings Canyon was once the location of not only a toll road, but flumes and, at one time, a resort and tavern. Cool stuff. This plaque shared the history of this scenic valley, once the Borda Sheep Farm. Dutch Borda was born in Minden to Ramon and Gorgonia Borda on July 17, 1921. His father moved to the Carson City area from Spain’s Basque country, and bought property off of Kings Canyon. 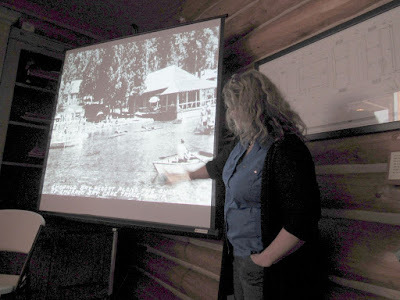 Borda’s mother ran the East Fork Hotel in Gardnerville until her death in the 1980s. Dutch eventually sold the Kings Canyon land through the Nature Conservancy in a deal which kept the land in one piece and put it under control of the Forestry Division as an historic sheep camp. What a wonderful gift to the people of Carson and to those of us just passing through. 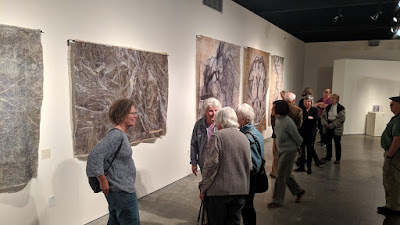 I was intrigued by the description of tonight's art gallery opening, "Join us for LTCC art student Paula Chung’s Hidden, featuring artworks consisting of medical imagery stitched onto used tea bags. You’ve got to see it for yourself!" According to Paula, "These images are universal. They cross religious, cultural and political beliefs, socioeconomic status, race and often gender. What they do not cross is age, nor do they reveal life experiences, wisdom nor emotion. We are their story—they are ours, reminding us of our mortality, strengths and fragilities." 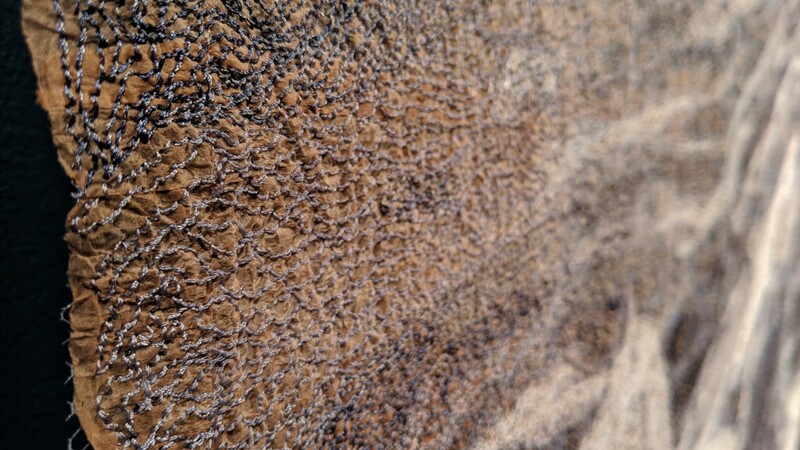 Paula's canvas are hundreds of used tea bags: washed, dried, ironed and then stitched together. 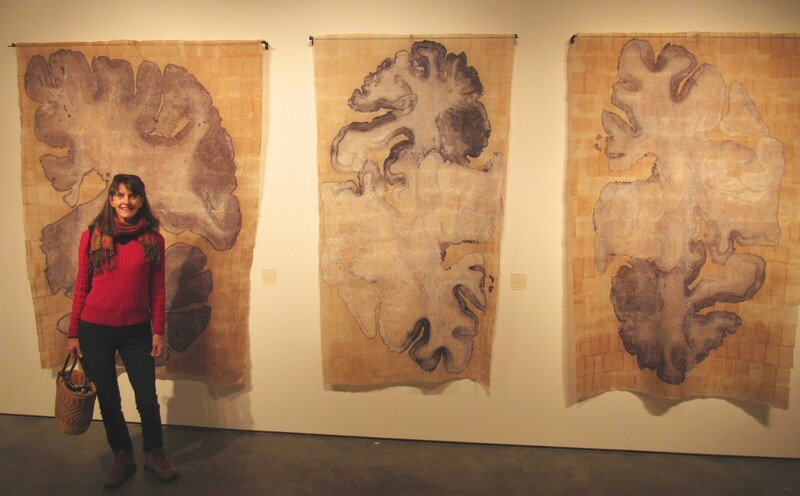 Her inspired images are those of MRIs, x-rays, and ultrasounds. Her paint is thread, two to six colors fed through a needle with her paintbrush being her sewing machine, embroidering what she has captured. It is truly amazing. There is absolutely no way I can describe these works without the intimacy of being right there. This work, documenting a brain with alzheimer's, took 600 tea bags and 1 1/2 months to complete. Wow. We have never seen anything like this before. We are so glad we were there for the Opening. I know this will not be the only time I visit Hidden before it leaves June 21st. It truly is "something you've got to see for yourself!" 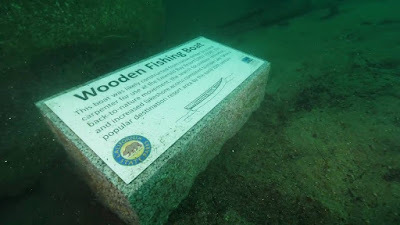 One our new favorite places to gain knowledge about Lake Tahoe is the Tahoe Maritime Center – Museum & Gardens which provides a unique cultural experience where the Lake Tahoe regional maritime heritage is preserved, enjoyed, and passed along to future generations through innovative interpretation and public education. Awesome right? With standing room only, we arrived to learn about what's under the lake. There's a mystique to what lies beneath the surface; likely due to the feeling of the unknown and the rare opportunity to explore the deep. 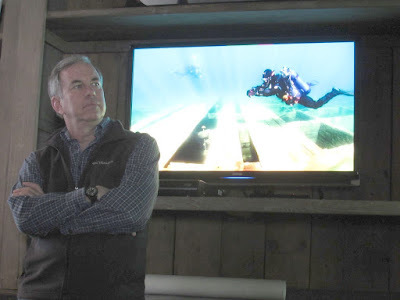 In this presentation, Denise Jaffke, archaeologist for California State Parks, and Walt Holm from OpenROV, gave a virtual tour of select shipwreck sites, including the Steamer Tahoe and the Emerald Bay Resort's Minifleet. Through modern technology, they were able to document and study these vestiges of our maritime heritage like never before. WOW. Emerald Bay, situated on the western side of Lake Tahoe, is and has been an American tourist destination for well over 150 years. Translucent blue-green water surrounded by vertical cliffs, green conifers, and granite boulders creates the quintessential Tahoe experience. And as you know, it is my happy place. Denise was there to share the history of The Emerald Bay Resort and its role in the brand new Maritime Heritage (underwater) Trail which celebrates the history of Emerald Bay and Lake Tahoe’s culture of recreation by way of sunken ships. The Bay is the final resting place of several recreational boats, launches and barges used on the lake during the early 20th century. This was the heyday of the Emerald Bay Resort (1920s and 1930s). After the heyday of the resort, it became the possession of the State (late 1950s) and it was dismantled and put back to nature. What to do with all the boats? Shuttle them in the Bay! At this point, Denise is recognizing the existence and location of eight mini fleet boats and two large barges, one over 100' in length. How incredible would it be to see Lake Tahoe's nautical history in such a way? These boats now serve as reminders of the golden age of recreation in Tahoe. This collection is the largest, most diverse group of sunken small watercraft of its kind, in their original location, known to exist in the nation. It makes me almost want to take up diving... almost. Walt's part of the presentation involved the SS Tahoe. By the end of the 19th century, Lake Tahoe had become known as a vacation resort, with a handful of hotels and communities scattered around its shores, serviced by a number of steamers crossing the lake. Lumber magnate D.L. Bliss ordered this vessel from San Francisco's Union Iron Works in 1894. It was shipped by rail in pieces to Carson City, then by wagon to Glenbrook, reassembled, and launched with much acclaim on June 24, 1896. At 169 feet, the SS Tahoe was the largest of the lake steamers. Her 200 passengers enjoyed a well-appointed interior, with leather upholstery, carpeting, and marble fixtures in the lavatories. Modern technologies included electric lights and bells, hot and cold running water and steam heating. The completion of a road suitable for cars all around the lake in 1934-35, followed by the loss of the mail contract in 1934 to the Marian B, made the SS Tahoe uneconomical to operate, and she lay unused for several years. Her beauty faded, the Bliss family knew what needed to be done. In 1940, the ship was scuttled in Glenbrook Bay. The owners of the steamship intended for it to sink in shallow enough water for tourists to see it from a glass-bottom boat, but the ship was sunk too far from shore and ended landing on a slope and sliding do a depth of up to 400 feet. Because of its great depth in a high-altitude lake, very few divers have ever been able to see the sunken ship, and no footage has been recorded of the ships interior. This is where Walt comes in. Beginning in 2012, it was his team's mission to find the SS Tahoe using OpenROV submarines and record video of its hull and interior. 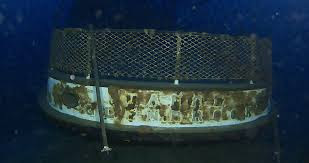 Walt's team developed the Trident, an underwater drone, which allowed the splendor of the SS Tahoe to be viewed again, 79 years after it was last seen. What truly amazing technology and what a truly amazing evening of Lake Tahoe history. Cheers to the Maritime Center, Denise Jaffke and Walt Holm for showing us what lies beneath and the history once lost. Only 44 miles from South Lake Tahoe lies the historic and interesting town of Truckee, California. 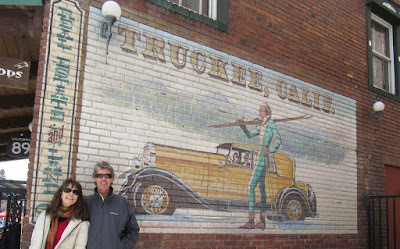 "Truckee is a place rich in history with a quaint downtown that hosts charming shops and superb restaurants set in authentic historic buildings. Recently listed on the National Register of Historic Places, Truckee proudly retains its historic roots. Named for a Paiute Indian chief who helped guide thousands of emigrants in their westward journey through 40-mile desert. Truckee is well known for its logging, ice manufacturing, the Emigrant Trail, as well as for the tragic expedition of the Donner Party." First order of business was lunch at Jax at the Tracks. This is one of those places we have driven past and always wanted to stop. We love eating in history. 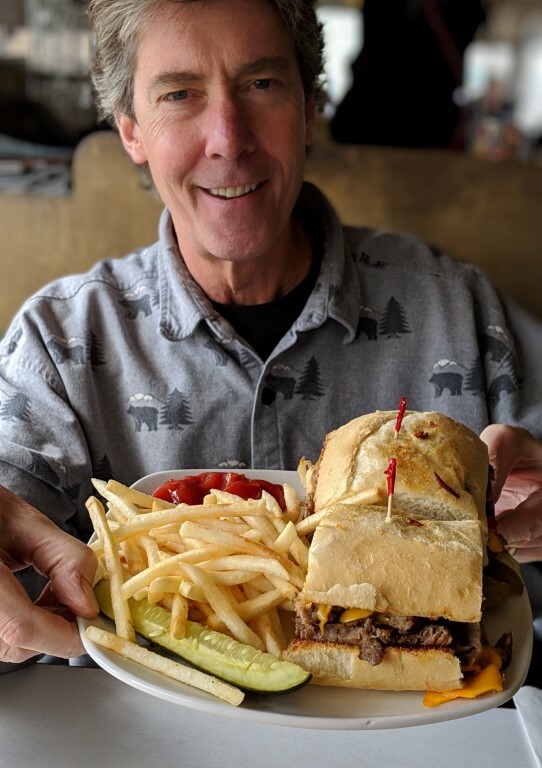 In 1992, successful San Francisco restaurant entrepreneur Robert Carey decided that this Sierra Nevada town, where he owned a second home, was ripe for a restaurant that offered great food at affordable prices. He read about a man who was saving historic diners from the wrecking ball. After much research, Carey found the Birmingham Grille, a 1948 Kullman diner that was for sale outside of Philly. Eventually (with much effort) the diner was delivered here and the rest is culinary history! After fueling up we wandered off the beaten path. Here history is being sold in order to save it and make it new again. This very in need of love Queen Anne residence had an asking price of $499,999. While this Vernacular Cottage had the asking price of $399,999. Both have sold. Boy the buyers must love projects. These seven cottages are to be developed into "tiny houses" and are still in the application process. Wow. In its heyday, Truckee had a whole lot of lumber to make a whole lot of homes. I love old signs on the sides of buildings, revealing their past lives. The Hotel Rex was built between 1870 and 1885 and renovated around 1915 after the 1913 fire. What an interesting discovery. On top of this monument is a sculpture of an eagle with its wings spread and sitting in a nest. The plaque reads, "Dedicated to California’s Sons and Daughters Who Served Their Country In the World War 1917 -1918 And to the Memory of Those Who Gave the Last Full Measure of Devotion". History was found all over this quaint town. This cabin is the oldest building in town and built by Joseph Gray. Mr. Gray and George Schaffer built and operated the first lumber mill in 1866. Quickly, many other sawmills were built to supply the demand for wood products for the Central Pacific Railroad and Virginia City mines. Structural lumber, railroad ties, poles, fence posts, shingles, mine timbers, charcoal and firewood were cut from the extensive forest and shipped all over the West. The lumber industry was Truckee’s biggest business for decades. This amazing thing is a snow plow rotary. Check out the video to see its power. Wow. We were curious by this statement. "DO NOT HUMP" is a command that tells railroad employees, in a freight yard, not to send a freight car so labeled over a railroad hill called a hump, a man-made structure for sorting freight cars by gravity. And how about this 160 ton steam-powered Bucyrus Erie crane? It has a long history handling railroad wrecks in the Truckee area. Wow. The town is filled with modern art, gracefully cohesive with the historical buildings. I particularly enjoyed The Band, a tall, slender, and contemporary structure of light and air, with each band member weighing about 800 pounds and measuring roughly 4 feet in diameter by 10 feel high. So cool. The shops, along Commercial Row, displayed unique and clever items to purchase. Some just made me laugh. After our time in town, we headed for an explore of two of Truckees four cemeteries. Tombstone by tombstone, the story of Truckee unspools on a large rectangle of greening grass where for more than a century and a half, gunfighters and botanists, ice harvesters and lawyers, lumberjacks and railroad workers have been buried. At the Truckee Cemetery, known formally as Sierra Mountain Cemetery, each tombstone marks a life lived, a piece of what the town is today. Woven together, these stories are Truckee’s history. But there are gaps in the narrative — broken tombstones, disintegrated wooden grave markers, tombs without names. Down the hill and without any grand entrance, we discovered the old Catholic Cemetery. Several tombstones we adorned with these odd porcelain figurines. I have never seen anything quite like that before and I frequent cemeteries. Hmm. Our last stop on the Truckee Historic Tour was a visit to this gazebo. Legend tells us that this rock was used by Native Americans who inhabited this area to keep their fish and dried meat safe from animals and birds. The slightest vibrations of the smaller stone served to frighten the birds away and the height of the larger stone was too high for animals to climb. Although the stone no longer rocks, having been cemented in place, the 17-ton stone is one of 25 known rocking stones in the world. Charles F. McGlashan, a prominent Truckee citizen, from 1872 to 1931, and the man who interviewed the survivors of the Donner Party and wrote The History of the Donner Party, built an enclosed, high-arched windowed tower over this rock in 1893. Inside the tower he kept many of the Donner Party relics and memorabilia, which are now on display at the Donner Memorial State Park Museum. Here he also kept his exquisite collection of butterflies and moths, which can also be viewed at the Donner Museum. History truly is everywhere. Truckee is one of those towns which demands further exploration! Its story is so much a part of California's. We look forward to our next visit and gaining even more knowledge. Fun stuff only 44 miles from home! Sign up to get notified of my latest blog post by e-mail.. Happy National Letter Writing Month!